Kingdom Hearts Chi is an interesting title where you play as one of the many keyblade wielders from the age of fairy tales. By using the Book of Prophecies, the Foretellers were able to conjure worlds and have their union members draw power from the future. Tensions grew as each union fought harder and harder to ensure that no one union held more power than another. This of course culminated in the Keyblade War. The Keyblade War resulted in the the X-Blade being shattered and the worlds divided, darkness had prevailed. The light survived in the hearts of children however, and the children rebuilt the worlds with that light. If we go any further than that, we go beyond the potential scope of Chi, but what exactly is the scope of Chi? Chi is the earliest point of interest within the Kingdom Hearts timeline. Its singular defining event is the Keyblade War, and so the scope of Chi revolves around the beginnings and aftermath of the Keyblade War. In a word, Chi is history. That history has been recorded within the Book of Prophecies, and it has also been brought to life by the book's own power so that we the players can experience the recorded events for ourselves. That's right, the first step in resolving the skewed storytelling perspective of Chi is understanding that we are essentially reading a book. This is actually fairly unimportant overall, but it's also critical to understanding a few things here and there. When you start the game for the first time, you are greeted with the Book of Prophecies, it opens up and we witness Kairi's Grandma telling her that familiar story, it then flips backwards until we reach the beginning of the player's story. Backcover (more than the title itself referring to its nature as a book) does the same, the first thing we see is the Book of Prophecies opening up. Despite Chi's nature as part of a history book, it should be noted that the events within really did happen once upon a time, and concerning those events we have our next skewed perspective to resolve - the chained and unchained realms. It's hardly a secret that Chi has connections to the Realm of Sleep, and I can say with confidence that the "Chained Realm" is actually the "Realm of Sleep". If you remember, the Realm of Sleep is where you find Sleeping Worlds - worlds that fell to darkness and were unable to return completely. These Sleeping Worlds, possessing hearts of their own, have dreams of the people and events that once filled their lands. They are stuck in a Chain of Memories, presumably on loop until awoken. So the second skewed perspective is the world's dream, things that really did happen once upon a time, but now exist only as memories. Everything that happens outside of the Unchained Realm happens in the world's dream, a dream of things long gone. Something that is particularly interesting is that the Master of Masters seems to be acutely aware of the dream, because he specifically sets a plan into action which will allow keyblade wielders to escape the dream - the Dandelions. Perhaps all of his actions were to orchestrate this? Regardless, I do believe that the original timeline had events going somewhat differently than what we witness in Chi (primarily due to MoM's actions), I believe that it was a total tragedy and everything was lost. Moving onto the Unchained Realm now, (which consists of the Realms of Light and Darkness as well as the between) we have a wasteland - the Keyblade Graveyard. This is where the Dandelion Union Leaders gather, I suspect that they are among the first (supposing that they aren't THE first) to step foot into the Realm of Light. Beings who once existed solely as a dream have now claimed a real existence - the true value and brilliance of the Master of Master's plan. These guys were given a copy of the Book of Prophecies and as we know, this book has the power to create entire worlds, and with such power they presumably created a projection of their home. This has served as a base of operations for all the other Dandelions who escaped into the Unchained Realm. This has also allowed the group to simulate conditions found only in sleeping worlds - the creation of new Dream Eaters (a literal pet project of theirs). The Dandelion Union Leaders explored the Foretellers' tower and meeting room, and utilizing their copy of the Book of Prophecies they implemented a ruse wherein they would convince the non-leader Dandelions that nothing had changed. This is where the story currently stands, but remember the story told by Kairi's Grandmother? The light that survived in the hearts of children, the Dandelions, will be used to rebuild the world(s) - and that is how the story of Chi ends. However, there are still plenty of interesting things that could happen between now and then. But that's not all, there is still one final piece of information that is necessary to fully understand the skewed perspective of Chi. Luxu, and the mission that he was given. Luxu was given the keyblade, No Name, which contained the Master of Master's eye. With this eye, he was able see the future and write the Book of Prophecies. This means that everything that occurs within the Book of Prophecies was either witnessed by the Master of Masters himself, or seen through his gazing eye. This has many interesting implications, most notable of all is how he recorded the happenings of the Dandelion Union Leaders. While another possibility may exist, it is entirely possible that Luxu is one of their members, and the only one that he could be is Brain. Why? We know that Luxu is a HE, and we already know what the other male members sound like. Regardless, that is the final piece of the puzzle. 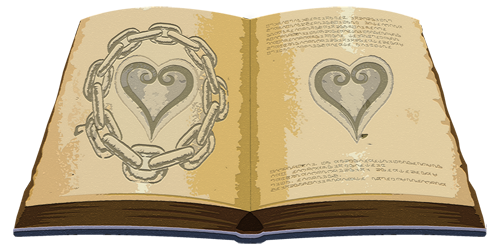 Kingdom Hearts Chi is a story within the Book of Prophecies that consists of two parts, the chained and unchained. These events supposedly all really happened, but are simply being retold. So wait, the Chained and Unchained Realm are in the BoP right? Or the BoP records the events of both and they actually happened already? So the game that we're experiencing right now is just the BoP, right? Because otherwise, it wouldn't make sense for Maleficent to enter it if it wasn't the Book. And what the heck is the Unchained Realm? Is it a completely separate Realm? Like it's connected to the Realm of Sleep, but a Realm for dream people who have awakened from the Realm of Sleep. Is that it? Also, only one of the Union Leaders has the book. If Brain=Luxu, and he was the one who suggested to create Dream Eater partners for the Wielders, then he's the one who's holding the BoP. But if he's holding the BoP, then isn't it contradictory for MoM to precisely not let him get the copy of the BoP? And if he's not holding the BoP, and Brain=Luxu, it's still contradictory for MoM to let someone hold the BoP in secret, because Brain=Luxu already knows it exists within their midst if he's able to make DEs. Then that sort of leaves the question as to who holds it then? The BoP has recorded the events of both. Correct, and this one of of those few times where being part of the book is important. Itâ€™s basically the Realm of Light (as well as the RoD and between). If the chained realm is sleep, then the unchained is â€œawakeâ€. Hm, good questions. Iâ€™ll have to think on these. One thing to consider here might be the nickname of â€œLuxuâ€ itself. It is the Latin word for â€œLustâ€ which isnâ€™t specifically sexual in nature, but rather denotes a desire for (unspecified) pleasure. Maybe Luxuâ€™s sin was a desire to enjoy friendship instead of his mission? Regardless, the MoM would have obviously seen whatever path that Luxu ended up taking, so itâ€™s kind of weird, lol. Unchained realm is a realm inside the book? The Unchained Realm is basically the Realm of Light (as well as the RoD and between). If the chained realm is "sleep", then the unchained is â€œawakeâ€. The Book of Prophecies is simply recreating these events, characters, and worlds/realms by its power to tell a story. As it currently stands, it is just a theory, but the evidence does seem to favor it. And to my knowledge, there's not any evidence disputing it either. We have all these little hints that have to mean something, right? Tbh, it sorta makes sense if you put it that way. It makes the Nobodies like Roxas, and Namine, along with Xion important post-KH3. The FFX-like scenario where dreamed people become real and have hearts goes in line with KH's overall theme. If this theory does indeed hold water, I can pretty much imagine how the next saga console game featuring the Union Leaders would work. Like what if the perspective isn't within the book this time, but from the very perspectives of Ephemera and co.? It's quite an ingenious justification for making a console game of KHX that way. The browser Chi's credits also makes sense if you put it that way. I've always been puzzled why Ephemera and Skuld are placed in the position of the player. I mean it's possible that there's probably no meaning to it, but well, it's fun to think of things.